I’ve just resurfaced from Eugene Textile Center’s Fiber in the Forest retreat. This annual retreat welcomes fiber artists to delve deeper into their craft for three full days. A multi-day fiber retreat is a pleasure, providing more time to connect with new fiber friends, go for a walk, and perhaps return with pockets full of foraged lichens for the dyepot. Forest fiber retreat at Camp Myrtlewood. 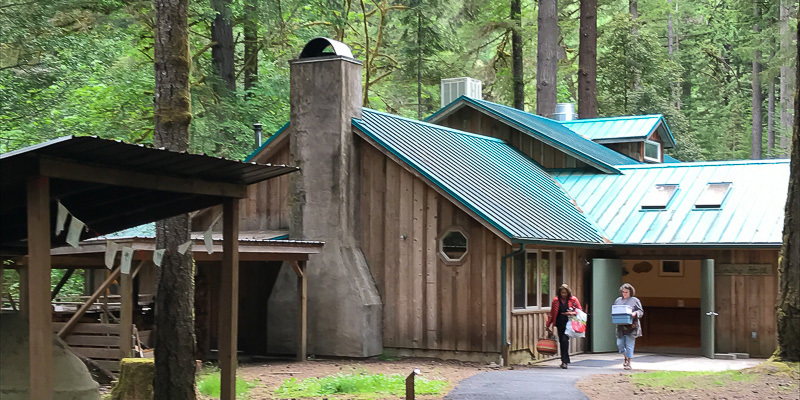 In the mossy, lichen-laden forest of southwest Oregon where Fiber in the Forest takes place, craft cross-pollination was on overdrive as spinners, weavers, dyers, and basket makers shared their work and discussed what they look forward to learning next. ETC owner Suzie Liles and teacher Madelyn van der Hoogt treated us to an evening presentation of stories about their lives in weaving and the important friendships that have grown out of the love of cloth. 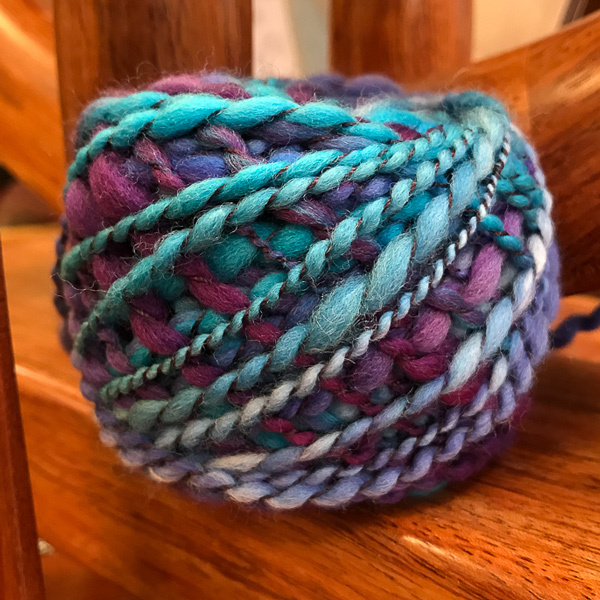 In the same spirit, a few skeins of my handspun cotton ventured into Barbara Setsu Pickett’s classroom for a dip in the indigo pot, while a hank of funky handspun created in the spinning class was incorporated into a basket in Sheri Smith’s Pine Needle Basket workshop next door. Anything might happen when fiber folk unite! Shanna’s beautiful thread-plied yarn ready for knitting. After a great weekend at the fiber retreat, I headed back to Eugene and spent some time at the ETC home base. Fibers and yarn, wheels and looms, books and dyestuffs are abundant in the shop. 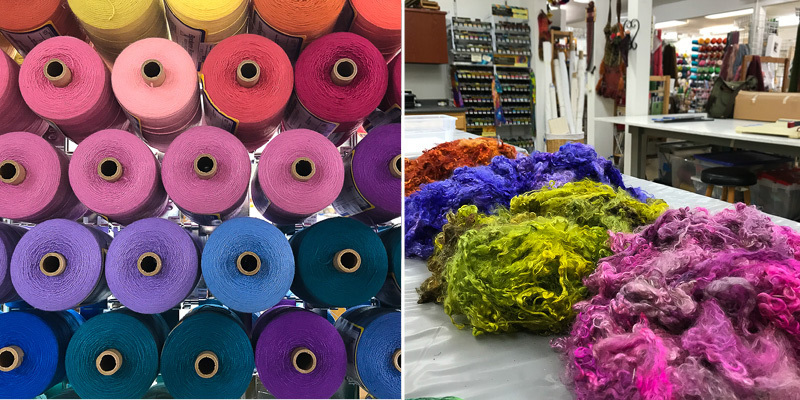 The day I visited, someone was washing wool in the large dye kitchen, and a guild meeting was going on in the onsite gallery space—this community of crafters embraces the textile process from beginning to end. Now I’m cheerfully heading home with a suitcase burgeoning with textile books, cones of linen, and bags of lichens. 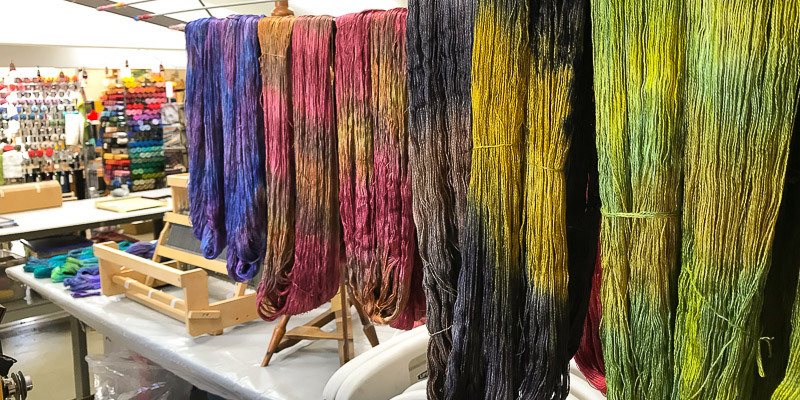 Bombyx silk warps dyed by Janis Thompson for Eugene Textile Center. 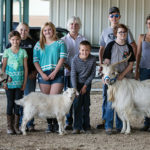 Escape for a Fiber Retreat!